So I disappeared without leaving word, and came back without making a peep as well. I thought about hanging up a “Gone to BlogHer Food” sign here, but didn’t get a chance to do so before I flew off to Seattle. For those of you that didn’t know, I went to BlogHer Food a week ago – if any of you went, I hope you had as fun a time as I did! I was invited to BlogHer Food as a speaker along with Stephanie, my fellow sated collaborator. Together, we assembled a presentation on past and current photography trends, and how to apply them to tell different stories about food. As a first-time speaker at BlogHer Food, I was pretty happy with how we did – we had some great interaction during the talk and we got some great feedback afterwards. I always love going to BlogHer Food because I always meet so many new, amazing people there – not to mention seeing old friends or meeting dear virtual friends for the first time in person. I’ve been meaning to pull my thoughts together since I returned and do a proper writeup of the presentation and my BlogHer experience, but it’s been taking longer to get myself back on track than I thought. It’s almost like after the intense physical and mental push to get the first issue of sated published, and then to assemble the BlogHer Food presentation, my mind decided to go into summer vacation mode. After I gave my talk, I had the next few days to enjoy the conference and Seattle, and I took full advantage of it. I returned home to a to-do list I’d chosen to procrastinate on until I got back, a pile of unwashed laundry, my doggie who demanded attention to make up for lost time, and some gloriously sunny weather – that I decided to enjoy, since the return of summer fog in San Francisco is always imminent. I didn’t quite want to let go of summer vacation just yet. I live near an elementary school, and I typically pass by it several times during the course of my day. I see parents dropping off their children off in the morning, the kids playing outside at recess, and of course. I walked by the school last week and I noticed how silent everything was – I hadn’t heard the sounds of the school bell or children walking home for a while. And then I realized, of course, that it was summer vacation and school was out. I don’t have an extended summer vacation planned for this year – probably one of the reasons I looked forward to BlogHer Food so much. No two week Mediterranean honeymoon for me this year! So maybe that’s why I have more vacation fever than usual. When the days turn long and languorous, when the weekend smells of jasmine and cherries and lemonade, who doesn’t want to toss out the datebook and declare summer vacation? So I confess that let things slide a bit, just to hold onto that summer vacation-y feeling a little longer. I slept in, I called up friends I hadn’t gotten around to catching up with in a while, I did do the laundry (eventually! ), I spoiled the dog a lot, I baked a cherry tart – and almost forgot to take photos of it before I ate it. It was kind of lovely. It’ll officially be summer tomorrow. Even if you’re not a grade schooler with the glorious prospect of three months of no homework ahead of you, don’t forget to enjoy yourself a bit. That’s what summer’s for, isn’t it? I do intend to share my experiences in Seattle, and yes, we are back to working hard on issue 2 of sated, never fear! In the meantime, I’ll share this cherry tart I made over the weekend: now that cherries are everywhere, it was a no-brainer to make dessert with them. 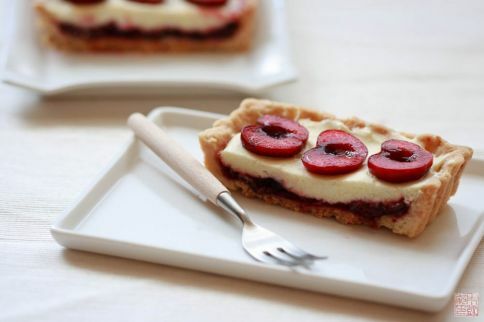 I used one of my favorite simple tart crusts, and jazzed up a pastry cream with coconut to give it a little more richness and luxurious contrast to the fresh cherries. I also put a layer of cherry preserves on the bottom of the tart shell, to make sure the fruit flavor came through and because it looked pretty. Combine flour, sugar, and salt in a food processor. Pulse to combine. Combine water and vanilla extract and drizzle over the mixture. Pulse to combine until the mixture resembles coarse crumbs – it should not be fully combined into a ball. Turn out mixture onto a piece of plastic wrap and form into a disk about 1 inch thick. If you have trouble making it stick together add a few more drops of water. Wrap dough and refrigerate for 30 minutes. Roll out dough on a lightly floured surface to a 10 inch round (to fit a 9 inch round tart pan), or to fit a 4 inch x 13 inch rectangular tart pan. Ease dough into the pan and press into the sides to form. Chill pan with dough in refrigerator while preheating the oven to 375 degrees F.
Line the dough with foil and fill with pie weights. Bake tart crust for 15 to 20 minutes. Remove the foil and bake until golden, 12 to 15 minutes more. Remove from oven and let cool. Combine 3/4 cup (172g) of the coconut milk with 2 Tablespoons (30g) of sugar in a small saucepan. Heat on the stove over medium heat until the sugar is dissolved and bubbles appear on the edge of the pan. Spread the cherry preserves evenly over the bottom of the tart shell. Spoon the pastry cream on top of the preserves and spread evenly. Fill the tart shell to just below the top; you may have some pastry cream left over. Wash and pit the cherries, and slice in half. 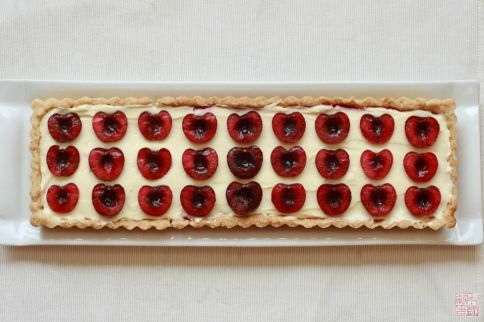 Arrange cherry halves on top of the pastry cream. Serve immediately. This is my kind of treat! welcome back, it sounds like you are one busy girl. Rectangular tart pans are my all-time favourite! The cherries look so cute! HI! I am from Argentina and I´ve been following your blog since last year. I must say I absolutly love it. It is beatiful, your posts are super interesting and of course, the recipes are delicious with great presentations! So congrats!! With respect to this recipe I wanted to know what other fruit you recomend to do it with. Here in Argentina is winter and as you can imagine cherries are very rare, if not impossible to get. So, what recomend? Thanks a lot and again, congratulations on the blog! This is absolutely beautiful! Awesome job! The cherry is ♥♥♥..LOve it! 🙂 Thanks for sharing the recipe..too bad..fresh cherries are not yet available here. But anyways..that’s just a minor problem..I will really make this possible. This is such a gorgeous tart! 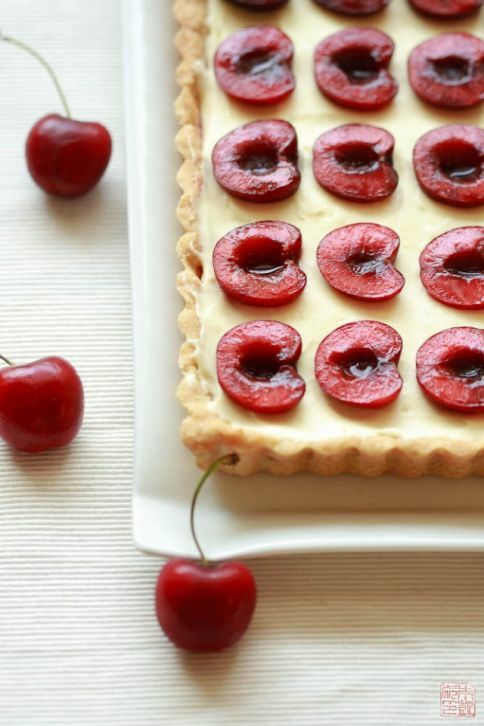 Perfect cherries and tart! It looks really delicious and I want a bite right now! Wow, these look absolutely beautiful! i love coconut cream pie and this looks like a great version in a tart! pretty! This looks lovely though I loathe coconut in any form. Can I sub the coconut milk out by itself or would doing so require additional changes? Yes, you can use regular whole milk in place of the coconut milk and it will work fine. Good luck! What fruits can you substitute with? I think any berries like strawberries, blueberries, will work well. Stone fruits like peaches or plums, if they’re not too overripe and juice, cut into slices would also work. It’s a versatile recipe! I believe pastry cream is by definition made with eggs. If you want to use a different type of filling, you can always try just plain whipped cream, or vanilla pudding. Good luck! Sqeee! This had me from the moment i saw it! I am making this beautiful tart as we speak. 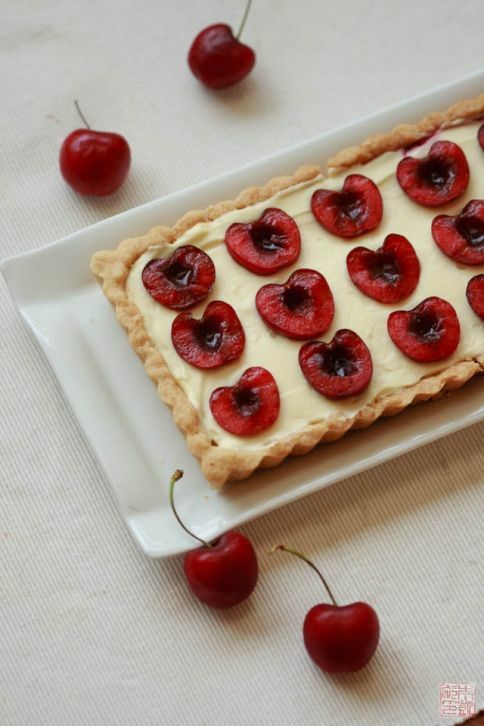 cherries are in season in australia right now so this is perfect! Can’t wait! What kind of coconut milk do you use? Is this the refrigerated kind or the kind that comes in a can? I used canned coconut milk – any kind you find at the store will do, but I like the Taste of Thai brand. Thanks! I saw this on a 4th of July roundup and just had to pin it.